Tubes sound better than solid-state. Tube watts sound more powerful than solid-state watts. Tube amps clip more gracefully than solid-state amps. Class A watts are better than class A/B. Single Ended Triode sounds better than pentode or ultra linear mode. SET amps need really efficient loudspeakers. Tube gear is more euphonic than solid-state gear. Tube gear is more expensive than solid-state. There seemed to be some significant reasons for a newcomer such as myself to stay away from tubes. But the recorded music to which I was first exposed had all come from tubes. The transistor radio had not yet been invented. But before you cast me off as an Ancient One, consider two things: Tube audio gear is still available, and some day you will be boasting that you remember the days of tube televisions. Although the "tube sound" had been implanted in my brain at an early age, decades of music produced on solid state gear had intervened. Recovery from solid state has been a gradual process. I started modestly and I was repeatedly rewarded by improved sound quality and greater enjoyment of music as I added more and better tube components. Still, the thought of owning expensive Big Name tube gear seemed beyond the horizon. But equipment that seems out of reach in one stage of our lives can sometimes be obtainable at a later one. You might want to read up on this stuff in anticipation of your ship coming in. When I was offered the opportunity to review the Kronzilla DX, I knew it would be a product that I could not fathom purchasing myself. Yet I jumped at the chance because, on paper at least, it was a breakthrough product. There was much I could learn from it. I asked not to be told the price of the amplifiers until after I had finished my listening and I proceeded with the suspicion that they were probably in the neighborhood of $40,000 � about twice the price of the less powerful Kronzilla SX stereo amplifier. It may also be of interest to you to know that I am not a life-long high-end enthusiast, electrical engineer or do-it-yourself type who has inhaled the smoke of solder resin all his life. I'm a life-long bicyclist; I hike up mountains and XC ski into the back woods. And like you, I enjoy listening to music. I am not a musician - I am in awe of good music. Fortunately, at the outset, I was told this pair was not for sale � it was a demo pair that had been used at the Las Vegas Consumer Electronics Show and carted all around the country in the service of setting up a dealer network. Jim Carnes of On Track Audio, the United States distributor of KR, backed his BMW into my suburban driveway and pulled the naked DX monoblocks out of the trunk. They are a lot easier to handle that way, rather than in the large wooden shipping crates. From my previous review of the KR VA340i integrated amplifier, I understood instantly. Inside, I had prepared a platform between and slightly behind my loudspeakers composed of a 2.25-inch layer of architectural slate, a plastic laminated MDF top from an old piece of furniture and under each monoblock, a Symposium Acoustics Isis shelf. Two meter Kharma Matrix Neo 1.0 interconnects reached back to the KR P150 preamplifier Jim had also brought along and eight-foot JPS Labs Superconductor+ speaker cables reached out to the Kharma 2.2 three-way loudspeakers. Jim took the T1610 tubes out of their individually numbered polystyrene foam padded cartons and inserted them in the individually numbered tube sockets. The T1610 tube is about the size of a 1.5 liter wine bottle; the pins are about as thick as pencils. The domed top of the tube filled Jim's hand as he pushed each tube down into its socket. I would have put my bicycling glove on first. I guess it is one of those anxieties in life that goes away after you've performed the task a couple dozen times. I offered Jim the listening chair and we listened for a short while until he proclaimed that this was the best he had ever heard this particular model Kharma. I accepted the compliment as testimony to my tweaking of the rig and the room, but reserved my skepticism until I had more listening time. It sounded good, but it was not a jaw-dropping experience for me. We had replaced two major components at once - something many reviewers would never even consider doing. My head was spinning with "What if...?" We talked for another hour, reaching a comfortable level of respect and commonality. Finally, he departed, reminding me that he would be back in two, maybe three weeks to pick them up. Two weeks is a very short time to review a major piece of equipment, and I felt under pressure to match the level I had achieved with the 340i review. Not only is KR a benchmark manufacturer of world-class audio tubes, but also the readers of this review might be considering the expenditure of a large sum of money. While it is not my task to please both sides of the equation, it is my responsibility to be diligent for both. After Jim drove off to his next appointment in New York City, I came back into the house and sat down on the step of my sunken listening room and just looked at the amplifiers sitting to the side of the gloss black Kharma loudspeaker. My G-d these are stunningly handsome amps. Next to my Manley Mahis, or even the KR 340i, they look huge, but next to the Kharmas, they look like they were made for each other. The KR is more masculine; the Kharma is more feminine, but together they created a perfect visual balance in the room. Had my Kharmas been painted one of the sophisticated alternative colors, the effect would have been even more dynamic. In black, the amplifiers will go well with almost anything. 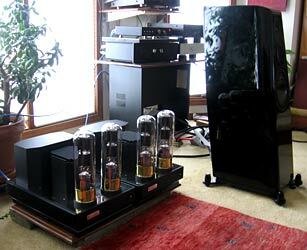 The two huge T1610 tubes are mounted at the front of each monoblock and two solid black structures cover the power supply and transformers behind them. They all sit on a polished stainless steel deck atop a platform edged in ribbed metal covered with black wrinkle powder coat paint. It seems rooted in the modernism of the 1930s with form concealing function inside geometric shapes, except for the tubes, which are hugely conspicuous and reveal the nature of the beast. The amplifier proclaims: I am architecture! I am art! I am music! With a little contemplation, another significant design element becomes evident, or rather, conspicuous by its absence. There are no visible input or driver tubes, revealing the hybrid nature of the DX amplifier. Riccardo Kron felt there were no really good small signal tubes in production today, so he opted for solid-state circuitry for all but the power stage. Consequently, the DX is a very clean design with few architectural elements, which should simplify the task of keeping them dust-free. (Note: the KR P150 remote controlled preamplifier that came along with the DXs is an active solid-state preamplifier, unlike the passive line stage of the remote controlled VA340i integrated I reviewed last year). The T1610 tube is a magnificent sight to behold and it will catch the attention of even the uninitiated. Only my neighbor, who had seen huge transmitter tubes while serving submarine duty in the Navy, was not in awe of their size. Ah, but submarines cannot make music like the DX. The T1610 was designed by KR as a twin 805 tube for Cary Audio, and is one of the very few new vacuum tubes designed for audio since the mid-20th century. The lettering on the glass is as exquisite as on the smaller 300 BXLS and 842 VHD tubes, but the complexity of the circuitry inside is about double that of the smaller tubes. When you visit the KR website, be sure to click on the photos of the tubes to enlarge them - not once, but twice, to view the largest possible images. Those photos, however, do not do justice to the brass bases of the tube, which, in real life have a brighter finish. Speaking of polish, the stainless steel deck of the DX, like the VA340i, provides a subtle visual contrast to the black crackle powder coat paint and minimizes the visibility of dust, but it is not polished to a mirror-like finish as I have seen on some other amplifiers. More importantly, it provides shielding for the amplifier, and keeps the visual focal point on the glass tubes, where it rightly belongs. With the amplifiers backlit by the sunlight coming from the window behind them, they were absolutely intriguing. (For serious listening, of course, I drop the honeycomb paper shades to reduce the reflection off the front wall behind the loudspeakers). In a darkened listening room the tubes throw off very little light. No cages protect them as they are unlikely to be used in an environment with unsupervised small children, and they radiate enough heat during operation to ward off curious pets. The Simax glass, which is similar to Pyrex, is very hard and seemed to be very thick when I tapped the tube with my fingernails. I wouldn't say they are as indestructible as the refillable Coke bottles of my youth, but I did not have any anxiety walking close to the amplifiers to draw the window blinds behind them � a task I performed daily to take advantage of the solar energy. In fact, I was surprised at how quickly I became comfortable having the DX in my rig. Like I tell the customers at my furniture store, people rarely complain about being sold high quality. They get used to it. With only two weeks, it was a big advantage that the amplifiers already had a lot of history. There was no need to break them in. I began with the set-up that Jim Carnes had delivered with the KR preamplifier sitting on top of my inoperative CAT preamplifier in the system. While I was cognitively engaged in the music, I felt very little emotional engagement. This wasn't nearly as inviting as my earlier experience with the KR VA340i with the 300BXLS tubes. There were plenty of good things happening � tight, deep bass, seamless presentation from bass through the treble, excellent focus, plenty of power � but nothing special was happening to grab my emotional core or make the music come alive. In this respect, it was closer to the 340i with the 842 VHD tubes. The third time I fired up the amplifier the left monoblock blew a fuse again, as it had done during set-up with Jim Carnes. After a phone call to Jim and an e-mail to Marek Gencev, chief designer at KR, I chased down an 8 Ampere fuse at a specialty electronics store to replace the standard 6.3 amp one. I had had a similar experience with the VA340i. Problem solved, just as before. With the fuse in the left amp, I had a notion that the transparency and the dynamics of the system picked up a notch. The fuse seemed to be of higher quality construction than the 6.3 Ampere fuse Jim had bought from Radio Shack. If I had more time with the KR, it might have dawned on me to swap out the fuse in the right monoblock for a higher quality 8 Ampere fuse. Another anomaly soon became apparent. The Kronzilla DX has a built-in auto-biasing circuit, as well as a sleep mode. Power to the amplifier is controlled first by a mains switch at the rear of the chassis. If you listen on a daily basis, you would normally leave this on all the time. Then, on the front of the chassis is a touch switch to bring it up to operating level. A light comes on red, and then turns to green when the amplifier is operational. The right monoblock took about 8 seconds, the left one about 12 seconds. When you are finished listening for the evening, you touch the switch on the front again, and the amplifier goes into the sleep mode, but does not shut down completely. The tubes in the right monoblock continued to glow a faint orange and remain slightly warm when shut down, but the ones in the left went completely dark and cooled to room temperature. Marek assured me not to worry, but I couldn't shake the feeling that something was amiss with the left monoblock. However, as I continued to listen through the rest of the review, I did not notice any audible difference between the monoblocks, and everything operated smoothly. Warm up time for the monoblocks seemed to be about a half hour to optimal level. Hoping to sweeten the sound, I put the KR P-150 on a set of Symposium Acoustics Rollerblock Series 2+ with a Symposium Isis shelf beneath it. The music became more focused and more liquid, but still did not have the depth in the soundstage nor the bloom that a good tube preamp can impart to the music. For those who like a drier, more neutral and perhaps more accurate sound, the P-150 seems to be a very good preamplifier with a low noise floor. But that is not my personal taste. And since the focus of this review is the Kronzilla, I swapped out the P-150 for a conrad-johnson CT-6 tube preamplifier that had come in for review. Keeping the Isis platform and the Rollerblocks beneath it, the CT-6 brought more depth to the soundstage and bloom to the music, making it more inviting and giving me more spatial cues. The music was coming alive for me and my toe was beginning to tap more frequently. Realizing that I was listening exclusively to CDs, I stripped the Boston Audio Design TuneBlocks from beneath my turntable and tuner and placed them directly beneath the feet of the DX monoblocks. The ball bearings that form the interface between the component and the carbon graphite blocks fit neatly into a concavity on each of the three feet of the amplifiers. The music took a very noticeable increase in focus and an increase in bloom as well. I felt like I was starting to make progress at this point, but I realized I was limiting my source to CD. In a moment of impulsivity, I left a barely coherent plea on an answering machine for Austin Jackson at Boston Audio Design to send me two more sets of the taller TuneBlocks with the tungsten carbide balls. This would give me the optimum vibration absorption for the DX monoblocks and allow me to replace the shorter Tuneblocks back beneath my turntable and tuner, re-establishing the source components of my reference rig. When they arrived, the thicker Tuneblocks and the upgrade TC balls worked additional magic on the monoblocks. Had I added them initially, instead of taking the interim step of using the shorter blocks with the standard balls, the improvement would have been even more dramatic. But I still had not gone all the way. I was using the TuneBlocks beneath the feet instead of directly on the chassis where I suspected they would do the most good. With Linda away doing mission work in New Orleans at the time, there was no one around to steady the amplifier as I lifted up one end or one corner at a time. 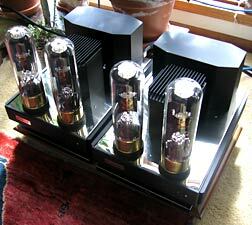 It was scary enough just placing them beneath the feet - these monoblocks weigh about 80 pounds (37 kg) apiece. Putting them directly in contact with the chassis would require placing them in a tighter triangle. I didn't want to lose control and have an amplifier slide off the platform, obviously. The compulsion to know the outcome overcame my fear and once they were lowered onto all three TuneBlocks, the weight of the amplifier made them very steady. The TC balls of the TuneBlocks merely transmit micro-vibrations to the carbon graphite blocks; they do not perform any rolling function. The Kronzillas sounded significantly better with the TuneBlocks directly in contact with the chassis. Furthermore, the dark grey blocks were inconspicuous and did not compete with the visual design of the Kronzilla. Personally, I would consider them as Standard Equipment. Unfortunately, I didn't think to call up Herbie's Audio Lab for some of his HAL-O 100 tube dampening rings specifically designed for the high temperature T1610 tubes. I've had great success with his smaller rings in my pre-amplifiers, and the large ones might well have made an additional contribution to the Kronzillas. Hopefully, the next person to review these amplifiers will take on that task. But now it was time to bring the rig around full circle and put the CAT preamplifier back in service to re-establish my reference system. It is for no small reason that the evolutionary versions of this preamplifier have been highly regarded for a ling time. 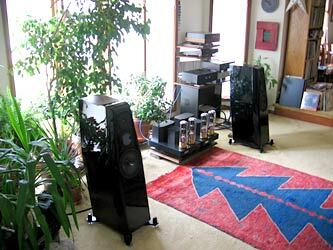 The trio of CAT preamplifier, KR Kronzilla DX monoblocks and Kharma loudspeakers danced in unison. Let me describe what the Kronzillas brought to the party. While no quality of the music appeared out of proportion to another, it was obvious that the DX gave a very smooth presentation from top to bottom. Like the Manley Mahi, it is strong in the bass, and this complements the tight, but slightly lightweight presentation of the Kharmas in that region. While the DX does not have quite the bass slam of the diminutive Mahi (yes, you read that correctly), the bass has more palpability, more smoothness and more sustainable strength. But the Mahi delivers the attack of the notes faster and with more impact. The DX was smoother than the Mahi throughout the audible spectrum, as you should expect when making a quantum leap in price. It was rich in tonal colorations and took complete control of the tweeter in the Kharma CE 2.2, which is not as refined as in the higher models in the line. (Kharma has recently introduced the CE 2.2c loudspeaker with a ceramic tweeter that I am now reviewing) The soundscape was expansive, benefiting from the improved focus of low frequency ambient cues. It was as wide, if not a little wider than with the Mahi, and more detailed at the back of the soundstage. The Kharmas are noted for being virtually seamless from top to bottom and for completely disappearing, in spite of being a moderately large floor standing loudspeaker. The Kronzilla DX did nothing to detract from the outstanding presentation of the Kharmas and enhanced it in the ways just mentioned. Several anecdotes from my listening experiences illuminate the greatness of this amplifier. Normally, I try to avoid references to specific recordings because it is so unlikely that we will have the same recordings, but I will try to describe the passages to get my points across. Take One: Wilson Philips, a trio of women with extremely tight harmony, do a cover of Elton John & Bernie Taupin's song "Daniel" on the compilation of covers called Two Rooms. On a normal day, with a good set of components, I can occasionally make out the fact that there are three unique women singing, and not a single voice overdubbing. With the Kronzilla, I could not only hear three distinct women singing for much of the song, but I could point to exactly where they were standing. Other great amplifiers will do this, too, of course. Take Two: Horowitz playing Mozart's Appassionata Sonata and Waldenstein Sonata on a Columbia Masterworks LP. With the Mahi or with the KR 340i equipped with the 300BXLS tubes, when the composition reaches into the lower registers of the piano, the tight focus that is present in the midrange softens. And in the upper octaves, the smaller amplifiers loose some of the critically important timbre. With the Kronzilla, the piano was seamless in focus, tonality, inner detail and weight from one end of the keyboard to the other. I later learned that one of these pieces was the work that made a good friend of mine give up playing the piano because it was so difficult he knew he could never master it. With the Kronzilla DX, listening to Horowitz perform it, I was so enthralled by the work that it never occurred to me that it was a difficult piece to perform. I am not particularly fond of either piano music or classical music, but these performances grabbed my attention. Take Three: The opening of the fourth movement of Mahler's First Symphony begins with a full orchestral avalanche that in lesser systems can come across as a startling slap in the face as the amplifier clips, the music distorts and the orchestrascape is obscured. With the Kronzilla, I was struck not with the music, but with a Gestalt of the entire performance: the orchestra, the audience, the concert hall and the music all at once. Rather than the attack of the distorted music, I was presented with the attack of the fourth movement - an instant transportation from the listening chair to the concert hall. The Kronzilla DX is rated at 100 watts per channel at 5 percent total harmonic distortion, but with tubes, this is typically an even order distortion that is less objectionable to our ears and brain. The first few watts are always the most important ones, and they will typically come with a much lower level of distortion. But even with all that single ended triode power in Class A with zero feedback, it is still important to choose your loudspeaker wisely. Distortion can come from any link in the audio system. I am also reminded of the Escalante Design Pinyon loudspeaker that was so highly focused and clean sounding that it simply begged me to turn the system louder, which of course, required more power. Other speakers can seem reticent until they reach a certain volume at which point they really come alive. A benign impedance curve can be as important with tube amplifiers as loudspeaker efficiency. I would still choose a loudspeaker that sounded good with a 20-watt tube amplifier. The additional 80 watts that come with the DX can then be used to enhance the dynamics and keep the musical peaks clean and musical. If you choose a loudspeaker that frequently calls for a hundred watts at your preferred listening level, you will be spending more time in that 5 percent THD zone. With the Kharmas, I cold listen comfortably with peaks frequently hitting into the 95dB range at the listening chair in my 6000 cubic foot room. More typically, I would be listening with frequent peaks in the 86dB to 90dB range. Getting much above 95dB in my large room the distortion would become tiresome, but not irritable. Nonetheless, I didn't want for more; the music was plenty enjoyable and I frequently discovered myself tapping my foot unknowingly. Of course, with a smaller room, more efficient loudspeakers, or fewer room treatments, you will likely be able to play louder with less distortion from the amplifier. As the old saying goes, every picture tells a story... and so does every tube. Tube rollers know this well, and different people have their favorites. Some amplifiers allow you to swap certain tube types, interchangeably. Others require minor modification for different tube types. And still others only allow different brands of the same type tube. With the Kronzilla amplifier series, the KR T1610 is the only game on the planet and they are about $1200 a pop. I'm told many men who own this amplifier buy a spare set of tubes as "emotional insurance." I'm also told this isn't really necessary. The tubes should provide about 10,000 hour of service and with the auto-biasing, it is simple to just plug in a new tube. At three hours of listening a day, every day, this would translate to over nine years. Of course, the earlier hours should sound better than the later ones. In this price league, obviously this is a serious amplifier and it is made only to order. But it is not one for the serious tweaker, aside from adding some TuneBlocks, perhaps. Rather, it is for the serious listener seeking to establish a very high level system and then get on with the pleasure of enjoying music. The DX monoblocks, introduced in 2005, are an innovative re-design by Marek Gencev of the original Kronzillas created by Riccardo Kron back in 1998 or 1999. The DX has many new features such as auto-biasing and other safety features not found in earlier Kronzilla models, making premature tube replacement an unlikely event. (Marek tells me the Kronzilla DX, SX and SXI now have the same auto bias and protection circuitry. The Kronzilla DM and SD have also protection circuitry but the biasing manages cathode resistors). The tubes have a one year warrantee, which is far longer than most manufacturers offer. As a hybrid design, solid state is used for both the input stage and the tube driver stage. In the power stage, two T1610 tubes are connected in parallel, working in pure Class A. As such, working at 33 percent efficiency, they dissipate 300 watts per channel as heat while providing 100 watts RMS. You will not want this amplifier in a small, confined room with a low ceiling but European castles and American McMansions should not be a problem. In upstate New York in the winter, it was a welcome heat source. The back side of the Kronzilla seen here houses the mains power switch, EIC power port (with access to the mains fuse), mains voltage selector, plastic shrouded European binding posts, the impedance selector cover seen here behind the twin leads of the speaker cable, and the single ended RCA input. In an age when vinyl playback and tube amplification have become so revered, the disparity in the development of new audio tubes vs. amplifiers, cartridges and turntables is notable. At every show, it seems, new models of the latter abound, yet new tubes designed specifically for audio seem to be found only from KR. In the mid to late 1990s they came out with the KR 300BXLS, KR 842VHD, KR PX-25, and the old T-100, as well as the T1610 covered here. In the new millennium, we have the KR PX-4, KR 845, KR 211 and the new T-100. Certainly, it is expensive to develop machinery for new tubes to be manufactured on a large scale, but KR Audio is not a financial powerhouse. They thrive on their creativity and their design rather than on mass production. Their hand made tubes are sometimes offered as a step-up for a premium price by other amplifier manufacturers. 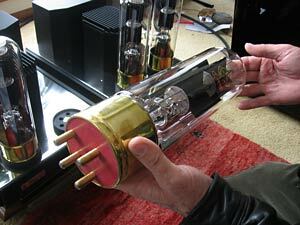 I feel honored to have been able to review two KR amplifiers and three of these new tubes. The T1610 falls between the crisp, crystal clear linear accuracy of the 842VHD and the more liquid and emotionally involving 300BXLS, though it is somewhat closer to the latter. Its bass drive and control exceeds both of them, and with its higher wattage, allows greater headroom for musical peaks. The mystery tube is the new T100, which has been used by only one manufacturer to date. It will be interesting to see the mini-Kronzilla amplifier that may come from KR Audio in the future. The BMW backed into my driveway once again. It had been a very busy three weeks for me, not only listening, but in my own business. There was no time for a double check, switching back to my Mahis, then back to the Kronzillas. Nor was there time to explore other directions, some of which did not occur to me until after they were gone. (I would have liked to try the amplifiers with the four ohm taps, for example). Jim Carnes and I listened to some music he brought along, then we shut the amplifiers down for the tubes to cool for repacking - each one in its numbered carton, again. "So," I asked, "how much are they?" And before he could answer, I offered that I thought they would be about $40,000. When he told me, my lips formed the word "Wow", but no sound came out. $25,000 � until the end of August, 2006, when existing supplies of some critical parts (transformers or power supplies, I surmise) would run out. After that, the price will likely go up. As to the question of value, I invite you to draw your own conclusions based on your discretionary funds and your passion for music. If you need this much single ended triode power, you have no choice other than the DX. But if you can live with some of the limitations of lower powered SET amplifiers, your choices multiply and in most cases the cost will go down. Although a dealer network is carefully being built here in the United States, you are not likely to find these amplifiers at your local emporium. Jim carried the un-boxed monoblocks out and placed them in the trunk of his car just as he had brought them. We both could have listened on into the night, but he had an appointment down in New Jersey that afternoon with a company you will never guess, and I will not reveal. Let's just say KR Audio is on the move. I walked back into the house and hooked up the Manley Mahis again. After three weeks with the Kronzillas, I was surprised at the bass slam and how well the Mahis rocked with the Kharmas. But it was not the same, nor should it be for an amplifier a tenth the price of the KRs. Sonically, the Mahis were a gentle letdown, and far from a disappointment after using the KR monoblocks. What I wasn't prepared for was the visual void created by their departure. It was like my favorite painting had been ripped from my wall. They not only sounded world class, they looked like they should be in the Museum of Modern Art if not beside a pair of Kharma loudspeakers. An ambassador of music had visited�and left. As I was sitting in the listening chair two days later, preparing to leave for work, Linda took the chair beside me and gazed toward the system. "You know," she said, "size really does matter."